John Cusak’s portrayal of famed literary icon Edgar Allan Poe is one of flailing arms, sharp stares, and a genuine affection for exaggeration. The character is tanked but by decisions not necessarily made by Cusak. This one is likely on director James McTeigue. Maybe he still has some left over energy from his deliriously stupid yet fun Ninja Assassin. Variances in the performance dim the early look at a Gothic Baltimore almost as much the as the lighting. Not only is the city clouded by fog, it’s drenched with moisture and dimming overcast. Work in terms of production design is lost aside from repetitious dusty bookshelves and desks littered with papers. Visual effects work has to pick up the period slack by extending the city for this murder mystery as a killer bases his work on Poe’s fiction. The set up is lively, certainly a fun alternate history tale of people killing based on media before it was in vogue. It’s also something a bloodthirsty audience will adore as men are sliced by pendulums, women are buried alive, and throat slashing effects are in their prime. Too often though, The Raven is quick to gross out for its atmosphere, say Poe digging into a human heart for inspiration, then feeding it to his pet raccoon. It’s character development… or something. Raven builds a rogue romance in a single scene, Poe’s affection leveled more at Emily Hamilton’s (Alice Eve) cleavage than anything else. His purpose is relieved when she’s kidnapped by the dark, mysterious figure who consistently eludes detectives, and Poe sets out to risk his life in a rescue. Poe reestablishes himself as a prolific writer, communicating with the killer through the local paper in a desperate bid for answers while earning the trust of uneasy police. The film wanders the streets, occasionally peppered with light action, or rather enough to make it appear that the leading cast members are in danger. Otherwise, they’re merely chasing a thug blind. 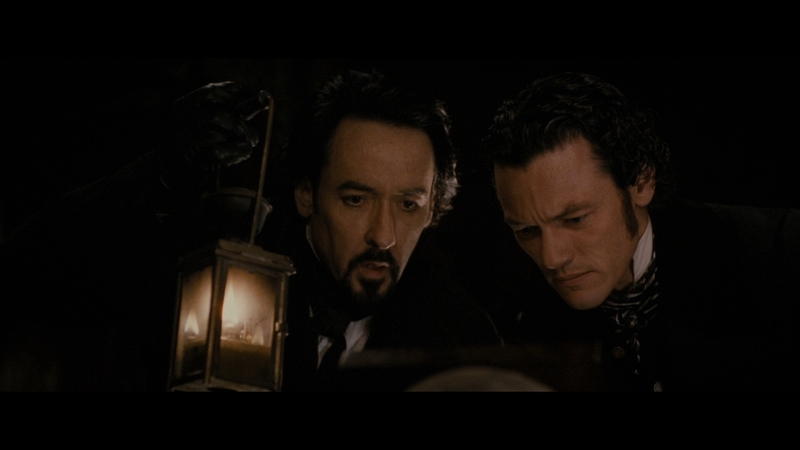 All of Raven’s tension is derived from a final scene in which Poe stares down his sickest fan, a performance that steals the film right under Cusak, and in a matter of a few minutes. Fitted with a score that skews modern for a false aesthetic, Raven comes across as a film in pieces, an idea jumbled in execution and sidelined with jarring flourishes of character where there is none. Poe needs to be an interesting beggar and alcoholic or else he’s nothing here, and Raven goes out of its way to establish his murky, often twisted thoughts through a forced personality. This film from the killer’s perspective? That would be something. Gifted with a coarse film stock that brings with it a dense layer of grain, Fox’s AVC encode is up for a challenge from the first passing frame. The camera swoops down into a park where fog has enveloped everything, ensuring this was shot on film. It’s hard to miss the grain, and even when posed with a certain problem, compression is well handled. Nothing appears amiss. Two color palettes collide ensuring nothing besides chilled blues and fire-lit warmth is allowed on screen. Dominating would be an understatement, and somewhat boring would be on cue. Even as the images are soaked with blood (and with some accentuation that makes you wonder if this was meant for 3D), primaries are dulled, lifeless, and flat. These are not images that will sell a disc. Further hitting the gloss are outstanding black levels, never giving up the void even if it means taking down the shadow detail. Halls, homes, and underground caverns are hardly subtle in their hearty destruction of shadows, and little depth is gained despite the consistency. As mentioned above, it doesn’t say much for the set work, which feels hidden most of the time. Any saving graces to this designed look? Salvaged detail for sure. In close, the camera soaks up facial definition, and lighting tends to swerve to capture the best angle whether it makes sense or not. Even with a lack of color density, Raven can be impressive when on display. A handful of questionable medium shots are quick passers and an exception. A DTS-HD mix greets listeners immediately, taking some shots at the LFE as a horse carriage passes overhead stomping on the ground, and generally causing a ruckus. As the film moves on, little will happen to match hooves hitting pavement. Stereos will split, although they’re almost disappointing during the pendulum swing. Separation is light as the blade swings to the sides, the split stronger during a party as a small orchestra plays on. That doesn’t make much sense. Of all the things to be a highlight, there’s a panicked underground search that brings out some superior echoes. The plan is to blow a whistle, yell a name, and continue searching. The search party splits, and the surrounds pick up the flack. It’s an effect that sells the space of the area, plus the isolation of the members. Director James McTeigue joins his producers (Mark Evans, Trevor Macy, Aaron Ryder) on a commentary track, that followed by a series of six deleted/extended scenes lasting about 11-minutes. The Raven Guts is a making of that’s positive enough to come across as a promo, yet well produced to pass as a piece full of behind-the-scenes anecdotes. Madness, Misery, and Mystery details the life of Edgar Allan Poe, albeit briefly at 10-minutes. Two space-wasting promotional pieces include Behind the Beauty and Horror and The Raven Presents, the latter being a sit down chat with Cusak and McTeigue for all of three minutes. A nicely done featurette on the music doesn’t make the score seem anymore appropriate, and Fox stuffs a few trailers on here for good measure.